Results are provided for development of refractory concrete based on modified alumina cement using chemical industry waste. 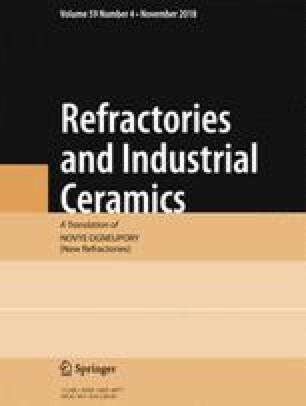 A quantitative ratio for mixed filler fractions, the effect of production factors on concrete strength, the dependence of its strength properties on form of filler, and solidification conditions are established. It is shown that with respect to physicomechanical and engineering properties the concretes developed is no worse than those existing in the market. With respect to all engineering properties this form of refractory product may be recommended as lining for high-temperature units. Translated from Novye Ogneupory, No. 9, pp. 47 – 51, September, 2018.